Despicable Me 3 is a highly entertaining movie for the entire family. Between the actual movie itself, both in script and picture/audio, as well as the amazing bonus features provided, there is no reason to miss the purchase of this home release. It is a welcome addition to every home. Universal Pictures and Illumination Entertainment are bringing us the third movie in the Despicable Me franchise this holiday season. This is clearly not the last movie, as the fourth is scheduled to be released in 2024, which after watching number 3, is exciting. Despicable Me 3 built upon the franchise, introduced new characters and further developed the characters it had already introduced us to and that we have come to know and love. One thing that really shines with this franchise is that every movie adds new characters to keep the audience's attention but never too many that overwhelms the storyline. Every character has a purpose and their purpose assists in keeping a cohesive and easily followed plot. In Despicable Me 3, Gru (Steve Carell; Despicable Me) loses his job with the Anti-Villain League and, in turn, loses perspective on his identity. Out of the blue, Gru finds out that not only does he have a brother he never knew about but that he is one half of a twin set! To complicate matters, Gru's brother, Dru (also voiced by Steve Carell) flies Gru's family to his estate on Freedonia, where it is clear that Dru is extremely wealthy and appears to be successful - two characteristics that Gru is presently struggling with in regards to his own identity. It turns out that Dru isn't as successful as he presents and desperately needs Gru's help. Love ultimately trumps everything and Gru finds himself again, with the help of his family, now one member bigger when he leaves Freedonia than when he started his self-reflection journey. While the film centers around Dru and Gru, there is another storyline that is presented with amazing details that comes across just right and that is the story about the sisters and the stepmom. Kristin Wiig (The Martian) voices Lucy, wife of Gru and step-mother to Margo, Edith, and Agnes. Agnes (Nev Scharrel; Fun Size Horror: Volume One) only wants a unicorn as a pet, while Margo (Miranda Cosgrove; iCarly) ends up unknowingly engaged and all the girls are having a really hard time acknowledging Lucy as their mom. Luckily, Lucy is able to handle all the girls' situations by herself (as Gru is too busy playing the bad guy with Dru) and the relationship between girls and stepmom becomes one of daughters and mom. The cast brings their all when providing voices, intonation, and emotion to their characters but Steve Carell is absolutely entertaining as the voices of both Gru and Dru. The difference in each character's tone is brilliant and, yet, Carell kept a similarity in each character so that the audience can recognize a biological bond, not just the physical resemblance. The reset of the cast compliment him well and the combination is enjoyable and aurally pleasant. The video is presented in 4K Ultra HD 2160p, with an aspect ratio of 2.40:1. The details are much finer and clearer than on the HD disc. The High Dynamic Range (HDR) of colors is always enhanced on the 4K UHD Blu-rays, but on an animation, especially Despicable Me 3 with the yellows of the Minions, the contrast of the black and white of the Gru brother's outfits, and the crisp bright colors in the scenery, artwork, and landscape, the colors just pop out of the screen. You can see the shine in Lucy's strawberry-blonde hair that isn't quite present on the HD version. The blacks aren't as inky as they probably could be but they are certainly deeper and darker than on the HD version. Audio is presented in Dolby DTS-X, which is amazing quality, especially in a movie in where sound effects are so important. Audio is crisp and clear. The sound effects, such as the car engine revving, water splashing, and luggage closing, are all heard clearly. Background noise is minimal to non-existent and there is no struggle to hear the dialogue. The pop songs scattered throughout the movie provide an energetic vibe for the movie. Bonus features can be found on both the 4K UHD and the HD Blu-ray. You very rarely find a 4K UHD extra features, so Universal has provided such a treat with the mini-movie The Secret Life of Kyle. 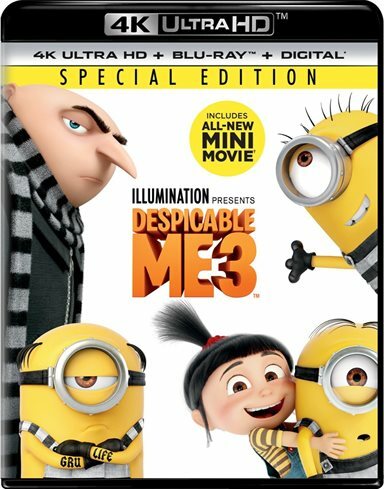 This mini-movie can also be found on the HD Blu-ray, along with Minions Moments (two micro-movies about the Minions); a deleted scene about Edith; and Character Profiles (cast sharing their feelings on the characters they voice); The Making of Despicable Me 3; Developing Dru; The ACL Files (interactive bonus feature- choose who you want to learn more about! ); Freedonia Visitors Guide (another interactive bonus feature allowing you learn more about setting locations); Despicable Me TV; "Doowit" Sing Along; Music Video "Yellow Light"; Minion Mug Shots; and Wanted Posters (for the Minions). Very few studios include as many- and as meaningful- bonus features as Universal/Illumination presents on Despicable Me 3. In addition, this version also comes with a Digital Code so you can watch the movie on the go. Download Despicable Me 3 from the iTunes Store in Digial HD. For more information about Despicable Me 3 visit the FlickDirect Movie Database.